This week has been a weird one…although, when I think about it, doesn’t every post start like that? The main weirdnesses have been the snow, ice and cold weather, and my return to work after 2 weeks off. Not that returning to work is weird, but at times I have actually enjoyed working this week, and even looked forward to going to Bristol on Tuesday. The impressive thing about that, is that it hasn’t snowed (beyond light showers) since Wednesday! Usually around here, it snows and settles then the temperature picks up and it rains and washes it all away within a day or two. We’ve been keeping the bird feeders topped up, and I’ve seen one fat pigeon tucking in. Not much to see so far, but I’ve just joined the front and back. Last night I decided I’d better attempt to try it on, so I threaded a lifeline through the live stitches, but then NCIS started and I realised that if I carried on with things like ‘taking live stitches off needles’ and ‘putting live stitches back onto needles’ while watching a new episode of my favourite programme, I was sure to cause some kind of disaster. So it’s waiting for a quiet moment for now. I finished the cross-stitch picture for Amy, delivered it last Sunday, completely forgot to take a photo of it! The shawl of doom is still waiting to be blocked, but we moved some furniture around in the library this week, so there’s now more floor-space. I might attempt it later this morning. We had to move the furniture because this room is so cold. The radiator is hot, the window is double-glazed, I don’t understand why it is so much colder in here. When you open the door you are greeted by an icy draught! Anyway, we’ve moved my desk to the alcove next to the window and radiator, so when I start to feel the cold I can shuffle my chair back a bit and warm up for a while. In other news…not much really. I had a hospital appointment on Weds, which got cancelled (snow). 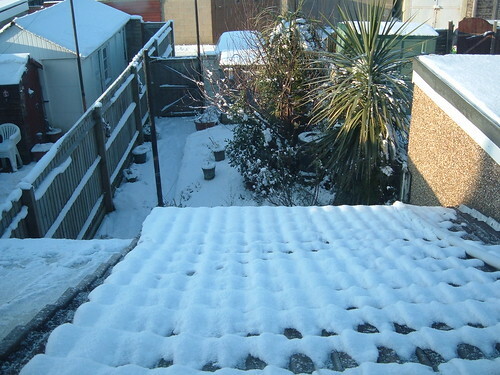 I was planning to meet my friend for lunch on Thurs…cancelled…snow. I didn’t go knitting on Weds, or into the office on Fri…yep, snow. This week I have a hospital appointment on Weds (re-arranged from last week), the usual work stuff including Bristol on Tuesday, and a nephew’s birthday next weekend. 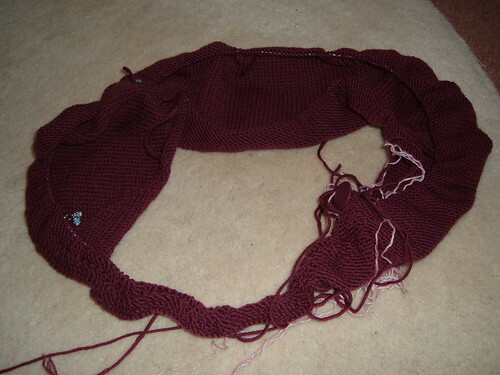 This entry was posted on January 9, 2010 at 11:42 am and is filed under Cross-Stitch, knitting. You can follow any responses to this entry through the RSS 2.0 feed. You can leave a response, or trackback from your own site.